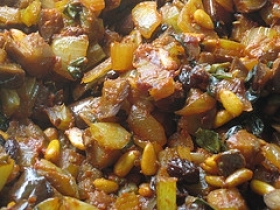 Have you made Caponata All Guidia (La Cucina Italiana)? 1. Place the eggplants in a colander and sprinkle with 1 tablespoon salt. 2. Let sit for 1 hour to let them drain their bitter juices. 3. Heat the olive oil until it is very hot. Gently squeeze the eggplant dry and blot with paper towels; fry until golden all over, turning often. 4. Remove with a slotted spoon and place in a serving bowl. 5. Add the onion and celery to the olive oil, and cook until crsip-tender about 5 minutes. 6. 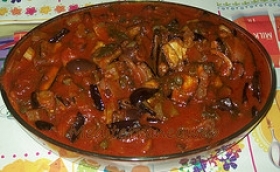 Stir in the tomatoes, olives, capers, vinegar, sugar, salt and pepper. 7. Cook over medium heat for 5 minutes. Pour over the eggplants in the bowl. 8. Add the basil and stir gently. Serve at room temperature. This recipe contains potential food allergens and will effect people with Eggplant, Tomato, Sulfites, Natural Sweeteners, Celery, Vinegar, Onion, Olive Oil allergies.